Summer is upon us and delicious strawberries are in season, making for perfect desserts. I baked this cake for a summer farewell do, although the sunshine was missing 🙂 One of our lovely volleyball club members was leaving and a cake seemed like a good send off surprise! Whilst planning this recipe, I wanted to keep the sporty and summery theme and at the time Wimbledon was around the corner. No summer dessert collection would be complete without strawberries and cream. Heat the oven to 190°C (170°C fan/ 375°F/gas mark 5). Lightly grease a springform cake tin and line the base with baking parchment, then butter the parchment. Put the eggs and sugar into a large bowl. Whisk with an electic mixer at high speed until the mixture is pale and thick. Sift in half of the flour and fold in gently. Then repeat with the remaining flour. Bake in a preheated oven for 30-35 minutes, until well risen and golden. Turn out on to a wire rack, peel off the lining paper and leave to cool. 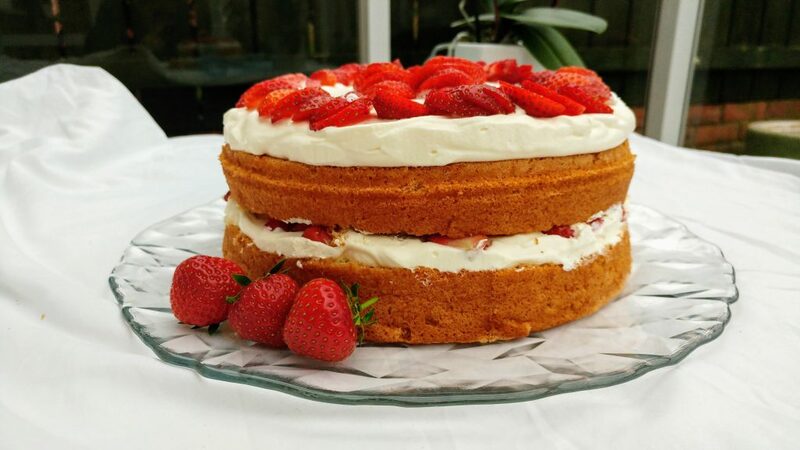 Split the cake in half horizontally and sandwich the layers together with half of the whipped cream and the sliced strawberries, pressing down gently. 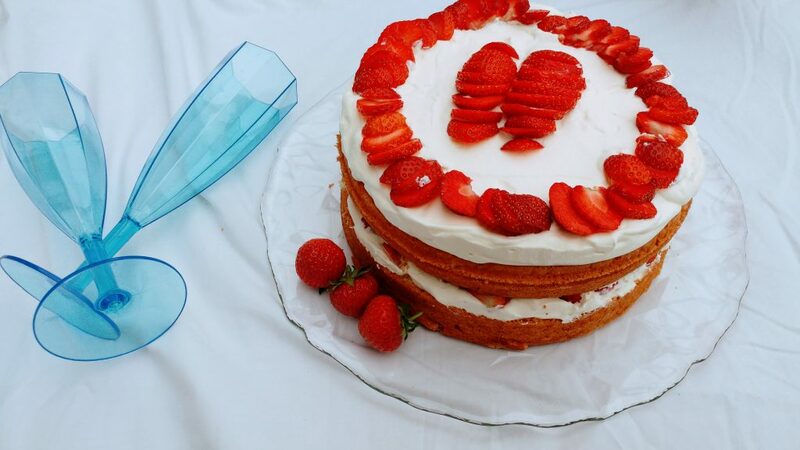 Spread the remaining cream on top of the cake and decorate with strawberry halves. 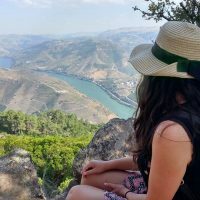 O Verão é o meu mês favorito do ano, desde sempre. Adoro as cores, os sons, os cheiros, os sabores e as sensações que nos permite. E temos, claro, ingredientes à nossa escolha muito mais coloridos e super apetitosos, como é o caso dos frutos vermelhos. Recentemente, uma das nossas muito queridas jogadoras do clube de voleibol regressou à sua terra Natal e este bolo pareceu-me a melhor forma de tornar esta despedida mais dócil. Na elaboração do bolo queria manter a influência desportiva e usar o sabor fresco das frutas de Verão. Para além disso, o torneio de ténis de Wimbledon estava mesmo à porta e não podia faltar uma receita que envolve-se morangos e natas. Pré-aqueça o forno a 190°C (170°C ventilado, 375°F, Gás 5). Unte uma forma de bolo com fundo amovível e forre o fundo com papel vegetal. De seguida unte também o papel vegetal. Coloque os ovos e o açúcar numa taça grande. Bater a mistura com a ajuda de uma batedeira de arames até aumentar de volume e obter uma massa pálida e espessa. Adicione metade da farinha e envolva delicadamente. Repita com a restante farinha. Leve ao forno pré-aquecido durante cerca de 30-35 minutos até aumentar de tamanho e estar dourado. Desenforme, retire o papel vegetal e deixe arrefecer completamente. Divida o bolo em metade pela horizontal e recheie com metade das natas batidas e os morangos fatiados. Por fim, espalhe as restantes natas por cima do bolo e decore com morangos. Thanks 🙂 Me too, cant get enough of her recipes! Looks yummy!I am going to try this :)Thanks for sharing! oh my! this looks soooo yummy! I really would like to have a piece right now! :). I’ve always been passionate about cooking and baking. I enjoy developing recipes with seasonal ingredients or whatever is available in my fridge or pantry. I also enjoy cooking and baking recipes that are both healthy and affordable.